It was late summer 1989 and UEFA Group 3 was still looking wide open. Soviet Union admittedly looked certain to win the group, but which team would finish second and also qualify for Italia'90? Austria and Iceland had met earlier that summer in Reykjavik, drawing 0-0 in a game where Iceland surely produced enough chances to get the winner. The result will have been seen as a small setback for Iceland, who were yet to register a win, and a valuable point for Austria. This match took place in festive surroundings in the city of Salzburg during the Salzburger Festspiele (27 July – 31 August). Austria usually play their internationals at Praterstadion in Vienna, so time and place of this encounter was surely no coincidence. Placido Domingo was one of the artists performing in the Festspiele, and the tenor was given the honorific task of taking the kick-off. Hickersberger was facing two challenges: How to replace Herbert Prohaska and Toni Polster? 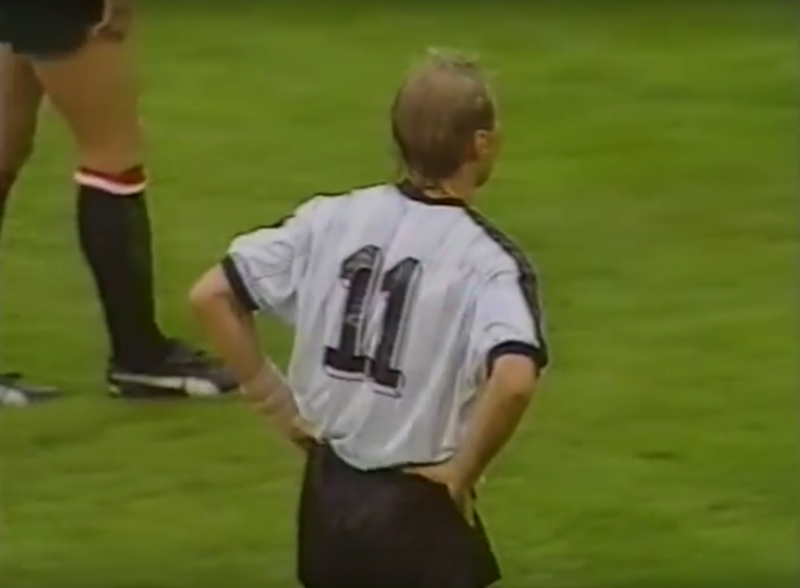 Prohaska had retired from football at the end of the 89-90 season, and the qualifier against Iceland away was likely the last official game of football in his career altogether. Toni Polster, arguably the star player of the team, was recovering from an injury and was only fit enough to start on the bench for this game. For this match, Hickersberger opted for a 4-3-3 formation, scrapping the 5-3-2 he had been using in the qualifiers thus far. Perhaps a sign of more attacking intent for this home encounter and a will to try something new. The 5-3-2 had otherwise worked quite well in their only home qualifier yet, against Turkey (3-2). In Austria's precedent qualifiers, Hickersberger had favoured Gerhard Rodax as the striking partner of Polster, relegating Ogris to the substitutes bench. The decision had likely more to do with Rodax's sensational form in the domestic league than Ogris' performances. Now, however, there was place for both Ogris and Rodax, and even a third forward: They were here accompanied by Heimo Pfeifenberger, who made his debut for the national team. There's nobody in Hickersberger's pool of players who can replace the qualities of Prohaska. His replacement had different strengths: Manfred Linzmaier is a player more known for his movement off the ball than what he does with the ball at feet. Linzmaier had only played 3 minutes as a substitute under Hickersberger's reign so far, as a substitute against Italy. A player like Alfred Hörtnagl must have been in contention for this place in the team, but he was instead making company with Polster at the bench. Austria played two unofficial friendlies prior to this game against local club sides, winning 6-0 against Anif and 17-0 against Kuchl (in which Rodax scored 7 goals). Some important were names missing from action also for Iceland. Ásgeir Sigurvinsson had not been released by his club team for this fixture, as VfB Stuttgart were playing against Eintracht Frankfurt in the 1. Bundesliga on the day (a 1-1 draw in which Sigurvinsson played the first 45 minutes). Regulars Eðvaldsson and Guðjohnsen were also reported to have been ineligible, likely because of injuries. Guðjohnsen had of course also missed the previous game. In place of Eðvaldsson, Held picked Ágúst Már Jónsson, an experienced performer who also had been seen in Iceland's central defence against the Soviet Union, and likely regarded as a 4th choice in this position in the eyes of Held. There had been more speculation in Icelandic newspapers about which player would replace Sigurvinsson in midfield. Eventually, Held opted for Margeirsson. The names of both Kristinsson and Ó. Torfason had however been frequently mentioned by journalists prior to the game. Apart from the team selection, there were verified rumours that Held was wanted as head coach by Galatasaray. There had even been contact between the parts. The Turkish season was about to start, and we must imagine that they were eager to find a solution. Difficult to say whether this created any unrest in the Icelandic team. Dane Peter Mikkelsen, stunningly only 29 years of age, had been put in charge of this fixture. He had made his bow on the international scene as a 27 year old less than two years earlier, when his task had been the 1988 European Championship qualifier between Northern Ireland and Turkey (1-0). This was already his second qualifier of the current campaign, as he had earlier been officiating the Group 5 game between Norway and Cyprus in May. Mikkelsen was surely an up and coming referee, and someone that both UEFA and FIFA officials were holding in high regard. This was his fourth international experience, as he'd also served as referee in an Olympic qualifier between Iceland and Portugal (in '88). This fixture was such a rare occurence that their inaugural meeting had come as recently as two months earlier, when the two countries had met in that 0-0 clash in Reykjavik. Austria had been very fortunate to escape back home with a point that day. There was a sense of freshness with Hickersberger's team this evening after that disappointing performance in Reykjavik earlier in the summer. Most noticeable, he had changed to a 4-3-3 system. It smacked of a new attacking intent from Hickersberger, and we need to take a closer look at the forward trio. We have become used to see Austria fielding a three man midfield in a 5-3-2 formation, but three men upfront was a novelty so far in the 1990 qualification. Hickersberger was here fielding Rodax as the central striker, with Pfeifenberger to the left and Ogris to the right. There was no direct replacement of the physical presence of Polster, but perhaps enough skill and pace to unlock the Iceland defence. One would perhaps expect both Ogris and Pfeifenberger played as inside forwards, attacking from the wide into the central zones. But this was not necessarily so. Ogris conformed to this role, but Pfeifenberger looked like a standard forward, playing off and to the left of Rodax. Mixed fortunes for the Austrian forward trio in the first half. 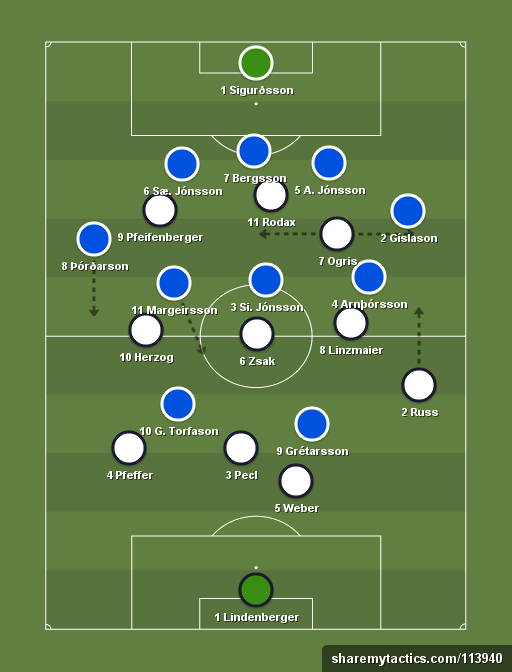 Iceland were generally successful at minimising spaces between their two banks (a defensive 5 and a midfield 3), and Pfeifenberger and Rodax found themselves mostly locked inside the Icelandic central defence, with Sæ. Jónsson man-marking Pfeifenberger and Bergsson keeping an eye on Rodax. Ogris was Austria's main source of movement, offering some movement between the lines and in wide positions, although he often would be picked up by A. Jónsson. If there had been more movement upfront, one would expect Iceland's central defence to be dragged apart. This didn't happen to often, though, and Austria were mostly finding it difficult to penetrate their opponents. New man Pfeifenberger didn't have much impact on the game, except for one particular aspect: The ability to get on the end of crosses at the far post. Twice he managed to finish an Austrian attack in this fashion, emerging from his otherwise oblivious existence in this game. The main attacking threat from the home side did not come from the forward trio, but from Manfred Linzmaier, the new midfielder. It was always going to be a difficult task for Hickersberger to replace the legendary Herbert Prohaska, who was able to dictate the game from his midfield position. Linzmaier is of course a very different kind of player, and gives Austria other qualities: Movement off the ball, above all. Linzmaier is an eminently lively player, seemingly always looking to go forward and exploit pockets of space, often unpredictable in his change of directions, able to go inside or wide. He's of a small frame, capable of quick acceleration and has good control of the ball. Here he was operating in the inside-right zone of midfield, often combining successfully with the burly Kurt Russ, who is no stranger to powerful forward runs. Both Linzmaier and Russ are players who have a direct approach to the game, sprinting forward as soon as they have passed on the ball, and their combined movement and direct intent proved difficult for Iceland to contain. Linzmaier always seemed to be available, and happy to run with the ball. It was really from his movement, in combination play with Russ and Ogris, that Austria could expect openings to be created. Things were far more quiet on the opposite side, despite the presence of playmaker Herzog, who had the assistance of the rather static left back Pfeffer and the anonymous Pfeifenberger. Hickersberger did however bring on a new left back in the 31st minute, as Robert Pecl was taken off and replaced with Michael Streiter, with Pfeffer taking place in central defence. It wasn't entirely clear if Pecl was carrying an injury, but the idea of bringing on Streiter as left back seems too minimal a change for it to be something a manager would have contemplated at this stage. Iceland's main priority was to maintain defensive shape and they weren't taking big risks when attacking. But even if they didn't send many men forward, they had real presence upfront with their two strikers, who caused much worry to the Austrian defence. Torfason and Gretarsson are both industrious and physical players, and clearly enjoyed their tussles with the Austrian defenders. The two were covering a lot of space inside the Austrian half and often interchanged positions. Iceland's main strategy was for these two to hold on to the ball and bring others into play. Torfason is the more burly of the two, while Grétarsson adds good physique with some very neat skill. The two proved very efficient: The Austrian defenders lost a remarkable number of battles with Iceland's forwards. Icelandic support from midfield could be limited, however. The idea was probably for one of the three midfielders do shuttle forward with a driving run, which they each would commit to as appropriate, but it turned out to be limited what these players could achieve when approaching the final third of the pitch. Still, Iceland produced two very good opportunities in the 1st half, created from a free kick and a long goal kick. Both chances involved an Icelandic striker winning a key duel inside or near the penalty area, which in turn brought forth key saves from Lindenberger. Sigi Held made a small tweak to his defensive tactics midway through the 1st half, as he instructed striker Torfason to assist midfielders Arnþórsson and Gíslason on the left hand side. Being an industrious striker, Torfason's presence was certainly helpful in hindering Linzmaier & co in continuing exploiting any spaces in that area of the pitch. This defensive move didn't do Iceland any favours in transitions, however, meaning that they had less of a presence upfront when trying to break forward, and for some period toward the end of the 1st half, Iceland were finding it more difficult to play their way out. If Iceland's left hand side was vulnerable, their right hand side looked slightly threatening. The right wing back Þórðarson was far more attacking-minded than his counterpart Gíslason, and he was assisted by Margeinsson, arguably the more skilled of the three midfielders. There was therefore a certain lop-sidedness in terms of attacking licences within the Icelandic team. Þórðarson proved to be somewhat of a nuisance to his opponents. To this should be added that the defensive qualities of Herzog were exposed when attempting to assist his left back. This reflects the story so far in Iceland's qualifiers, but the tendency was probably more pronounced in this match. In comparison, Iceland's left hand side was virtually a dead zone. Gíslason was hardly seen beyond the midway line at all, which reflects his unadventurous playing style. His "partner" Arnþórsson – as the other midfielders – would take route one towards goal when taking licence to contribute to attacks, uninterested in exploiting any wide areas. A big aspect of this first half was the large number of shots attempted from long distance. That fact itself tells something of two teams finding it difficult to penetrate into the opponent's danger zones. These shots were however invariably of very poor quality, with the exception of one attempt from Zsak. More interesting was perhaps the corner routines that Austria displayed. They were given no less than nine corners in the first half, and a few of these were crossed directly to a player lurking outside of the penalty area. A good ploy from Austria, and quite surprising to see Iceland allowing that lurking Austrian to be unmarked again and again. Other than that, we saw a few feeble attempts from Herzog that never troubles the Icelandic goalkeeper. 0-0 at half-time, but it felt like both teams had enough attacking qualities or at least intentions that would produce a goal on the evening. Hickersberger's 4-3-3 was showing some promise, especially when involving the livewire Linzmaier. Could there be more involvement from star player Ogris and perhaps also Pfeifenberger after the break? Iceland were mainly sitting back, and hadn't been much of a threat on counter-attacks, but the two forwards were making life difficult for the Austrian defence. Austria took the lead in this game only 4 minutes into the 2nd half. The goal followed a pattern in the game, as the attacking movement was initiated by Linzmaier on the right hand side. In this case, Linzmaier set pace from the midway line and cruised past Gíslason to cross the ball from the byway line – the cross landed at the feet of an unmarked Pfeifenberger who slotted the ball behind the goalkeeper. Good reason for Iceland to rue their man-marking on the occasion, as no less than three players had been occupied with Ogris, leaving Pfeifenberger on the far post all alone. 1-0. If Pfeifenberger had had little impact on the game, he had somehow managed to be in the receiving end of these crosses a few times already. Good goal scoring instincts! Austria's lead didn't last long, however. 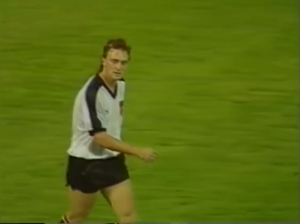 It's well known that teams are vulnerable immediately after scoring, and here Austria conceded a goal within a minute after Pfeifenberger had sent them in the lead. The producer was still busy showing slow-motion pictures of celebrating Austrians before in a hurry switching back to the game, as Iceland had gone straight from kick-off to build up an attacking move down the right hand side. A cross into the penalty area was cleared into the feet of Margeinsson, who suddenly found himself in a good position to angle the ball into the net. 1-1. Due to the producer's lack of attention, it is difficult to say how the move was produced, but it appears to have involved Þórðarson and Grétarsson on the right hand side. Regardless of who was involved, Iceland had all evening been interested in the right hand side and Grétarsson remained vital in playing in other players. Good goal also from Margeinsson, who had continued to shuttle forward to support his strikers. With Prohaska having retired, you feel that Manfred Zsak's role in this Austrian team will be more important. He looked to have established himself as a regular in the team's midfield now, having started the qualifiers first as a wing-back and then as a substitute. Zsak is (like Linzmaier) a different kind of player from Prohaska, unable to dictate tempo in a game in the same manner as the legend. But he's efficient in distributing passes to the wide areas, and also makes the occasional incisive pass to the forwards. If he's not the most imaginative player, it works for Austria, as they – in theory – should have enough creativity in Herzog. Having Zsak in the center of the midfield trio instead of Herzog is only natural, as Herzog doesn't have the defensive qualities needed to cover. How did Hickersberger's forward trio fare in the 2nd half? He had shuffled things in the break by making Ogris a left-sided inside forward and bringing Pfeifenberger over to the other side, in tandem with Rodax as forward. The change of sides worked very well for Ogris, who by attacking from the outside left could cut inside and shoot with his favoured right foot. Spaces were admittedly opening up as the second half wore on, but this seems anyway to be the position in which Ogris always should play. The change was a good idea for another reason too, as Þórðarson became visibly less interested in going forward, since the Icelandic wing-back had to keep an eye on Ogris, whereas he had had few hesitations in joining attacks in the first half. Pfeifenberger and Rodax, though, remained without much impact in this game. Even as Iceland started to become stretched in their quest for an equalizer, Rodax found it difficult to use his pace. There were never spaces behind Iceland's defensive line, and he was left to lead a couple of counter-attacking moves which did show that he can move swiftly. As for Pfeifenberger, he largely had a game to forget apart from the goal. Other than that, Hickersberger made one more change in the 2nd half, as he brought on Alfred Hörtnagl for an injured Herzog. It's not the first time Herzog has been injured in these qualifiers, but here he had had a quite mediocre game, and for the sake of tactical priorities the substitution was beneficial for Hickersberger. Hörtnagl's work rate is after all better than that of Herzog. Still, it was a forced substitution, and we do know from the pictures that Hickersberger at this stage was ready to send on star striker Toni Polster, who was making himself ready on the sidelines. He was more than likely going to replace either Rodax or Pfeifenberger. However, with Herzog's injury, he had to bring on Hörtnagl instead. The last 30 minutes of this Festspiel game faded out without Iceland really staging any credible comeback effort. Sigi Held didn't seem to have a plan B at his hands this evening. There were no visible tactical changes after going 2-1 down, and, somewhat surprisingly, Austria continued to have the upper hand for much of the remaining time. Held made two substitutions, both straight swaps that had little impact on the proceedings. Arnþórsson picked up an injury and was replaced by Runar Kristinsson, Margeirsson was substituted for Ómar Torfason. This was very much like for like, and not even fresh legs seemed to have much impact. Iceland's best asset remained Grétarsson, who enjoyed a very good game upfront. He could come very deep at times to collect the ball, offering some much-needed flair to the midfield unit, and fashioned some movements that might have produced something more. His impressive performance suggested that Iceland had a player capable of creating opportunities. Other than that, Siggi Jónsson had a couple of efforts from long distance, but Iceland's comeback more and more looked an unlikely affair. Hickersberger could take a few positives from this game, showing that the team could produce results without Prohaska – and even without Polster. In particular the lively Linzmaier had been impressive, giving a performance suggesting he should be a regular in the team from now on. There had also been positives from Ogris, who Hickersberger should consider as an inside forward, possibly thriving in a 4-3-3. Other than that, he must have worried about how to use the talents of Rodax and Herzog. Iceland had given a new solid performance, but proved again unable to get the needed results. Sigi Held could be happy with his tactics on the day, however, although he clearly didn't have much to offer once they were trailing.